After a split of the weekend with St. Lawrence and Clarkson, Quinnipiac freshman Wyatt Bongiovanni took home his third ECAC rookie of the week honors per a press release from the league office. He had a hat trick and an assist in Friday's 7-2 win over St. Lawrence. Two of the goals came by way of the power play. It is the sixth time this season that a Quinnipiac freshman has taken home the rookie of the week honors. Bongiovanni who picked up his first collegiate hat trick previously was the rookie of the week for February 4th and November 19th. It was his first four point game at Quinnipiac and his third game this year with three or more points. Bongiovanni is tied for second on the team with 14 goals scored and is sixth in scoring with 22 points. Congratulations to Wyatt on another great accomplishment. Quinnipiac concludes the regular season this weekend when they travel to Brown on Friday before a short drive down Whitney Avenue on Saturday to face rival Yale at Ingalls Rink. 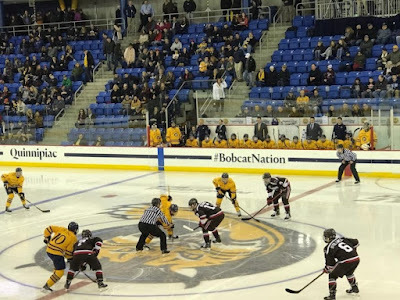 It wasn't how Quinnipiac planned senior night at the People's United Bank Center as the Bobcats struggled in a 5-3 loss to Clarkson. It was a night the team honored their five seniors including captain Chase Priskie, assistant captain Scott Davidson, Craig Martin, Luke Shiplo and Brandon Fortunato for their service and dedication to the men's ice hockey program. Here are my thoughts and observations along with some quotes from Rand Pecknold and Chase Priskie following the loss. - It was a sloppy effort all around for Quinnipiac as they struggled with puck possession all night as Clarkson did a good job in the neutral zone and preventing the Bobcats from having easy entry into the offensive zone. The second period was one of the worst periods of the season when they surrendered four goals to Clarkson. "We didn't buy in and we strayed from our identity, Rand Pecknold said following the loss." - The one bright spot on the night was Chase Priskie. His first goal was and end to end masterpiece where he dangled past multiple Clarkson defenders before putting it past Jake Kielly while his second one was a blast from the point that gave him 39 career goals which is the most in school history for a defenseman. What Chase Priskie has accomplished in four years is pretty outstanding. He came in as an undrafted freshman in the summer of 2015 to get an early start and put up a 26 point year to in his freshman season in helping the team reach the Frozen Four. He got drafted that spring by Washington in the 6th round. He followed up his sophomore campaign with another 26 point season and was named the captain for his junior season and had another consistent 25 point season. He returned to Quinnipiac after the team struggled and has turned in a 39 point season so far as a senior leading the team to the brink of the NCAA tournament along with being a Hobey Baker candidate. Throw in the fact that he got his undergrad degree and MBA in four years as a cherry on the top. Chase Priskie is the heart and soul of this team and one of the best players to ever put on a Quinnipiac sweater. - Andrew Shortridge was hung out to dry against Clarkson. Hardly any of those goals were his fault and Quinnipiac had sloppy turnovers in their own zone or the neutral zone to lead to breakaways. He did all he could back there with how poorly his defense played in front of him. "You are not going to win in this league or any league 6-5 or 7-6, Chase Priskie said following the loss. We have to be better and we can't give up grade A chances. Andrew played good tonight. We can expect those big time saves every night and we just didn't give him a chance on any of those goals." - Quinnipiac's top line of Odeen Tufto, Wyatt Bongiovanni and Ethan de Jong really struggled tonight. The line was a combined minus seven on the night with six shots on goal. For this team to have huge success especially come tournament time that line is going to need to have success. Tufto also struggled on the face-off dot winning only 10-of-24. - I said after the Friday game that I wanted to see how Quinnipiac responded offensively especially on the power play as you couldn't judge them against a terrible team like St. Lawrence. Tonight they had two massive power play opportunities and fumbled them. In the first period the Bobcats had a five on three advantage for 1:24 and had very few shots while in the second period they had a five minute major which they did nothing on as well. Give Clarkson credit for their penalty kill as it was a difference in the game. - Speaking of Clarkson that was a hungry and desperate team that played last night. They came into the night having gone 4-4-1 in their last nine games and having dropped to 15th in the pairwise a dangerous spot to be in this late in the season. While this win won't put them in the tournament right now it was a huge boost for them pushing them to 12th in the pairwise and also in position to clinch a first round bye next weekend at home. "I thought Clarkson was really good tonight, said Pecknold in his opening statement. They dug down and finished their chances. They were good on special teams and they deserved to win." - What is it with the struggles of Quinnipiac on Saturday night the second night of a back to back? They are 6-6-1 on the second night of the weekend with their Friday record 11-1-1. Part of it is you are practicing and game planning for your Friday opponent while its really unknown how much prep goes into the Saturday opponent until right after the Friday game ends. Add in the fact that this is a young team playing 9-10 freshman a night and you are going to have some struggles at times. However if you want to have success in the ECAC tournament and NCAA tournament you are going to need to prove you can consistently win those back to back games. 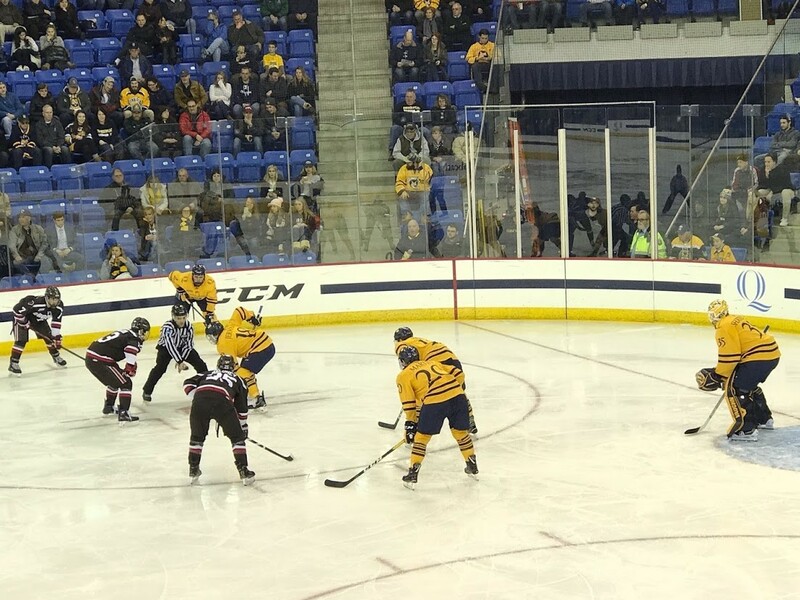 - A night after RPI's surprise win put Quinnipiac in the driver's seat for the Cleary Cup, the Bobcats moved into the passenger seat with the loss to Clarkson coupled with Cornell's win over Union 3-1. The Big Red moved a point ahead of Quinnipiac with just two league games remaining next weekend. Cornell travels up to St. Lawrence on Friday followed by a huge showdown with Clarkson on Saturday night. Cornell should beat the Saints pretty easily but should be in a battle with the Golden Knights the following night. - It's pretty amazing that as we head to the final weekend of ECAC play that no team has clinched a first round bye yet. Seven teams can still get a bye though teams in spots 5-7 need some serious help for that to happen but Cornell is in the drivers seat for the Cleary Cup needing just a win coupled with losses by Quinnipiac and Harvard on Friday to clinch it. Quinnipiac needs some help as they will likely need to sweep the weekend or get a win and tie with Cornell and Harvard both losing a game to win the regular season title. Whoever finishes 5th will get St. Lawrence in the first round as they are the only team locked into a spot. For any team on the pairwise bubble it is not an opponent that will help them either. - It's on to Brown. 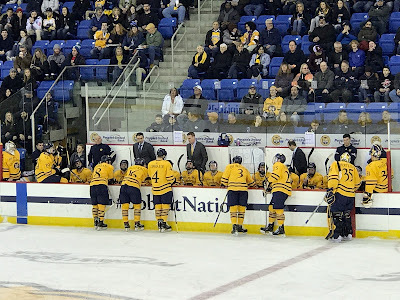 The Bears came into Quinnipiac on February 9th and took it to the Bobcats winning 4-1 and really dominating the neutral zone and the fore-check. Quinnipiac needs to play a much better possession game and on defense if they want to beat a surging Brown squad who have clearly played above the 12th place finish they were predicted in the preseason. One mentality for Quinnipiac that they need to do is just focus on the Brown Bears and not the game against the Yale Bulldogs the next night in New Haven. Brown is the most important game on the schedule right now and if they want to win the Cleary Cup as regular season champions they will need to win that game in Providence first. The penultimate regular season home game ended in a winning fashion for Quinnipiac as they took care of business on Friday night beating St. Lawrence 7-2. The Bobcats score three first period goals and five unanswered en route to cruising to an easy win over the last place Saints. The 23rd win of the season matches the teams total in the 2016-2017 campaign. Five different players scored for Quinnipiac who now welcome Clarkson on senior night on Saturday. Here are my thought's and observations from the St. Lawrence game. - Quinnipiac's offense exploded in the win over St. Lawrence scoring 7 goals. The Bobcats got off to a fast start with three first period goals with all of them coming by way of the power play. Chase Priskie, William Fallstrom and Wyatt Bongiovanni each scored first period goals on the man advantage to stake Quinnipiac to the early lead. The offense did what they had to do against the last place team in the ECAC as they swept St. Lawrence this season by a combined score of 14-4. - While it was a great offensive display and Quinnipiac scored three goals on the power play, I need to see if this will carry over to tomorrow's game against Clarkson and the rest of the year. Coming off three games of offensive struggles, the opponent tonight Quinnipiac faced is one of the worst in the country. If they can put say four to five goals in tomorrow against Clarkson then we may see the offensive struggles possibly in the rear view mirror. The power play did look improved with Ethan de Jong moving to the top line to fill the void of Brandon Fortunato. - It was a huge night by Quinnipiac freshman Wyatt Bongiovanni with a hat trick along with an assist. Bongiovanni is now tied for second on the team in goals with 14 with five of them coming on the power play. He has 22 points on the season which is one behind fellow freshman Ethan de Jong for the most by a freshman this season. The Michigan native brings so much speed and skill for Quinnipiac along with the ability to finish something that was clearly lacking last season. - St. Lawrence is a really bad and undisciplined hockey team. They hung with Quinnipiac for the first seven to eight minutes of the game then took a penalty which led to the first goal. They took another penalty right after Quinnipiac scored on its first power play but killed it off but ended the period with two penalties including a bench minor for too many men on the ice. Those two penalties led to another two goals for the Bobcats and they never looked back. The Saints are young and two of their talented younger players scored in Gleekel and Hanson but at this point in the season I feel like St. Lawrence should show a little bit more discipline on the ice. - The Saints had two golden chances on the power when they had a full two minute five on three after Scott Davidson and Joe O'Connor took penalties for hooking and unsportsmanlike conduct respectively and a five minor major penalty when Brogan Rafferty made contact to the head of one the St. Lawrence players. However both times St. Lawrence put up a big fat zero on the man advantage as Karlis Cukste blocked three shots on one power play alone. When you have these types of advantages you can't waste them and St. Lawrence big time tonight. - Speaking of Brogan Rafferty that was a dangerous penalty he was assessed and totally unnecessary to do in that situation. Rafferty is one of Quinnipiac's most important defenders and with Brandon Fortunato sidelined for the season becomes even that more important on the defensive and offensive end as you saw with his three assist night. His contact to the head penalty resulted in a five minor major and a game misconduct. Its unknown if any additional supplemental discipline with be handed down by the ECAC. - It was an easy night for Andrew Shortridge who only had to make nine saves before getting some rest and giving way to Keith Petruzzelli in the third period when the team had a big lead. He lowered his goals against to a nation leading 1.24 along with his .950 save percentage which also leads the country. Right now he is the favorite to win the Mike Richter award in my opinion as the top goaltender in the country. - Really nice to see senior associate captain Scott Davidson have a two point night. He assisted on the sixth goal by Nick Jermain and scored the seventh and final goal of the game. While points have not come every game for him he brings toughness and good defensive play from the third line and is a glue guy for for this team. Tonight he was rewarded for a really good effort. - Quinnipiac honored head coach Rand Pecknold prior to the game with a 500 banner to commemorate reaching that milestone earlier this season. Already the greatest men's ice hockey coach in school history, Pecknold is also one of the great coaches in college hockey today. Its a been a true honor having him coach this university to the success it has had. - Whats on tap? Senior night takes place tomorrow night at the People's United Center against Clarkson as Quinnipiac will honor its five seniors which include Chase Priskie, Craig Martin, Scott Davidson, Luke Shiplo and the currently injured Brandon Fortunato. While this team will play a minimum of two more home games with a maximum of three its a good chance to go out and thank these players for the years of service they have given to Quinnipiac hockey. Its been three weeks since Quinnipiac last played and beat St. Lawrence and in that time the Saints have yet to get a single win. They tied Dartmouth last Saturday and the night before skated to a tough 3-2 loss against Harvard. Since the 7-2 loss to Quinnipiac, St. Lawrence has been competitive in the last two weeks of ECAC play. Will they bring that same effort this weekend against Quinnipiac. Right now that is unknown but you can never overlook an opponent even as one as bad as St. Lawrence has played this season. Quinnipiac needs these two points as they continue to chase Cornell in the standings for the Cleary Cup crown. St. Lawrence comes to Hamden with one of the worst offenses still in the country ranked 55th averaging 1.93 goals per game. That however isn't even the worst in the ECAC as that honor belongs to Colgate. Over their last four games, St. Lawrence has only average 1.75 goals per game. They still do not have a goal scorer who has double digits in goals scored. Freshman David Jankowski has seven goals this year while sophomore Cade Gleekel has six and freshman Zach Risteau has five. Its a young offense with very experience that is suffering growing pains but should get better in the next couple of years. The Saints power play is almost middle of the pack at 17.2% which is 35th in the country. The Saints continue to boost the worst defense in college hockey. However when these teams last played they were giving up over four goals per game. That number is now just below that at 3.93 per game. So there has been some slight improvement but part of it can be attributed to playing Colgate and Dartmouth in that four game stretch. Is this defense turning a corner or will Quinnipiac blow them out of the water like they did when they met in North Country? The penalty kill has not improved either as it has dropped to 77% which is down from 78.% when these two teams previously met. Freshman Emil Zetterquist has played the past four games in goal and has given up 2.75 goals per game for the Saints. Those numbers may not be anything special but they are vast improvement over what St. Lawrence has done over the course of the season. At 6'1, 190, Zetterquist brings solid size in net for the Saints. This will be his first game against Quinnipiac should he get the start on Friday which is likely considering he has started the past four games. The last four weeks have been up and down for Clarkson. Over that time frame the Golden Knights have gone 4-4 and are currently sitting at 13th in the pairwise rankings which is a tough spot to be in this late in the season. For Clarkson they are going to need this game along with the Cornell one the following week in order to boost their pairwise status as they are clearly close to the cut line and a possible bubble team heading into March. For Quinnipiac they need to be able to continue to keep pace with Cornell in the race for the top seed and the regular season title. While Clarkson has a very good offense, over the past eight games there has been some drop off. They are no longer in the top ten in goals scored as they are currently 17th at 3.10 goals per game while the power play has also dipped below 20% at a current rate of 19.4%. This is still a dangerous offense lead by Nico Sturm's 36 point and Haralds Egle's 31 points. Freshman Josh Dunne is third on the team with 11 goals scored while Jack Jacome and Devin Brosseau have 20 points apiece. It will be interesting to see if their recent offensive issues translate a bit this week on the road. The defense has also slightly slipped in terms of stats but not a great as the offense has. Currently they are allowing 2.00 goals per game which is 7th in the country up from the 1.88 they allowed when Quinnipiac played them in North Country. The penalty kill is just a shade off from where it was a month ago as it is currently at 84.9% which is good for 12th in the country. Their top four of Aaron Thow, Greg Moro, Jordan Schneider and Connor McCarthy have been workhorses playing in every game this season for Clarkson. Jake Kielly continues to put together another fine season in between the pipes for the Golden Knights. He has started all 30 games for Clarkson and is 20-10 with a 1.92 goals against average and a .929 save percentage with five shutouts this season. Against Quinnipiac the last time out he made 19 saves and gave up three goals in a 4-2 loss to the Bobcats. Over his last eight games during the up and down stretch for Clarkson, his goals against average is 2.12. Despite a little bit of down play, he has the capability of turning in a strong effort on a nightly basis. Quinnipiac got into the win column and got two much needed ECAC points after a late Odeen Tufto power play goal stole a win in regulation on the road. Coupled with losses by Harvard and Cornell, Quinnipiac sits only one point out of first place with four games to play. Here are my thoughts and observations after the RPI game. - Quinnipiac probably stole this game in regulation but they will take it. A late penalty on RPI's Donovan Ott opened the door for Quinnipiac to get out of Houston Field House with a 2-1 win after Odeen Tufto banged one home from the slot for his 14th goal of the season. It was the first power play goal for Quinnipiac since the St. Lawrence game. - Andrew Shortridge only made 18 saves but really kept Quinnipiac in this one with a key save on Brady Wiffen on the power play to keep the score 1-0. He made the saves he had to make and continues to play at a high level and likely will be the ECAC goaltender of the year if this play continues. - This game was a dogfight with RPI and frankly I am not surprised one bit. The Engineers have been one of the better ECAC teams since the calendar has turned to 2019 and they have a very good goaltender in freshman Owen Savory who continues to play at a high level and keep RPI in games. The RPI defense was also very good cutting off lanes for Quinnipiac to shoot. Color me impressed by RPI and I believe they will be a tough out in the ECAC playoffs with the way they are playing. - It is definitely time to be a bit concerned with this offense as they have a combined four goals in their last three games. The injury to Brandon Fortunato is showing up right now as they have not been able to get into a rhythm offensively the past three games. If they can't improve the offense over what we have seen the past three games then this injury is clearly going to loom large for this team. - It was a big night for the Bobcats on the face-off dot as they beat RPI 44-18 in that category. William Fallstrom continues to remind me of Tommy Schutt on face offs as he won 10 of 12 tonight while Nick Jermain won 15 and Odeen Tufto won 12. Scott Davidson also went 5 for 5 on the face-off dot as well. - Daniel Winslow returned to the lineup and scored the tying goal in the second period and had a great celebration to boot. Winslow has given this team four goals this year but none bigger than that one so far. Two of his four goals have come against RPI in both of the games this season. - I thought the Quinnipiac power play struggled at times with too much cycling of the puck and not enough shooting. They need to put the puck on net and create chaos in front of the net to cause redirects and deflections for goals. Good things happen sometimes when you put pucks towards the goal. - The win moved Quinnipiac back to 5th in the pairwise after Saturday night as Ohio State was swept on the weekend by Minnesota. The Bobcats remain in a good spot right now and can still get a number one seed depending on how they finished the regular season and conference tournament. - Next weekend is the final regular season home stand of the year with St. Lawrence on Friday followed by a very good Clarkson team on Saturday night which is senior night. Chase Priskie, Brandon Fortunato, Craig Martin, Scott Davidson and Luke Shiplo will be honored for their four year careers with the Bobcats. 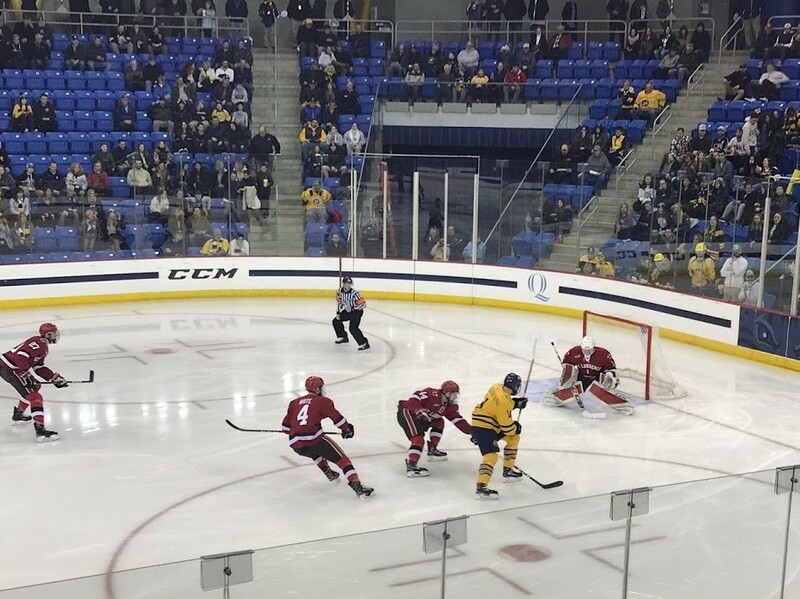 While this wasn't the most pretty performance for Quinnipiac, they were still able to salvage a point after a 1-1 tie against a tough Union team on the road. In the ECAC there are no easy games each and every week you look up and down the league scoreboard and you can constantly find upsets. Both teams battled hard and goal-tending stole the show. It was a fast paced game with a good amount of action despite only two goals scored. Here are my thoughts and observations after the Union game. - Andrew Shortridge made 27 saves and on this night Quinnipiac needed every single one of them. He made a huge save in the first period on a shot from close range and another one in overtime with the game on the line. Shortridge showed why he should be a finalist for the Mike Richter award with this performance as he was the best player on the ice for the Bobcats and they might have lost this game tonight if it weren't for him. In each of the seasons that Quinnipiac has reached the Frozen Four they have gotten outstanding goal-tending first from Eric Hartzell in 2013 when he was a top three finalist for the Hobey Baker award and in 2016 from Michael Garteig. With the way Shortridge has played this year, he could carry this team to Buffalo. - Quinnipiac's top line provided the only scoring when Odeen Tufto sent a pass from the end wall into the slot where Wyatt Bongiovanni sent one past Hanson for his 11th goal of the season. Ethan de Jong got a secondary assist on the goal. Bongiovanni is third on the team in goals scored with 11 trailing Chase Priskie (14) and Odeen Tufto (13). He's been an excellent add to the Quinnipiac roster this season. - William Fallstrom was a monster on the face-off dot. He won 20 of 24 face-offs on the night for the Bobcats and helped win some key possession battles. His teammate Odeen Tufto really struggled on face-offs tonight winning onlly 7 of 25 face-offs. They need better than that from their top line center especially when some of these are happening in the offensive zone and could lead to extra scoring chances for Quinnipiac. - The ice at Messa Rink was really terrible all night. Pucks weren't being controlled like they usually are and they were bouncing over sticks multiple times. Its pretty unacceptable for the ice of a Division I hockey team especially one that has won a national championship in the past five years to be as bad as it was tonight. - Union's defense was really good tonight taking time and space away from Quinnipiac and making it difficult at times to get pucks into the zone. The Dutchmen also blocked an astounding 25 shot attempts on the night. Darion Hanson also was fantastic for Union with 27 saves on the night. He continues to make a difference for Union in goal and has been a thorn in Quinnipiac's side twice this season only allowing two goals against a powerful Bobcat offense. - This was a very chippy game was a bunch of extra curricular stuff after whistles. However the officials swallowed their whistles tonight and assessed only two minor penalties on the night with a boarding call on Union's Zachary Emelifeonwu in the first period and a hooking call on Quinnipiac's Karlis Cukste in the third period. These are the types of games you want to see the players win on their own and not have the referees decide it. - Quinnipiac is still hasn't won in six games against Union dating back to the 2015-2016 season. They also have not won at Messa Rink since the 2014-2015 season. The Dutchmen will be a tough out in the ECAC playoffs and not a team that I would want to face in the quarterfinals should Quinnipiac get a first round bye. - The tie dropped Quinnipiac to 6th in the pairwise after Friday night but they remain three points behind first place Cornell who tied Brown 3-3. Quinnipiac is now tied for second place in the ECAC standings with Harvard at 22 points with identical 10-5-2 record. Spots 2-7 in the ECAC standings are now separated by a total of four points so expect a lot of chaos in the next few weeks of conference play. - Tomorrow's game against 9-17-2 RPI will be a challenge. This is a team that has started to play well in the second half of the season and has found themselves a goaltender in Owen Savory. They can't be overlooked at all especially after rallying from two goals down against Princeton and winning 6-2. The Engineer players are starting to buy into second year coach Dave Smith. For a team that got off to an 8-3-2 start, it has been a struggle at times for Union to find consistency. At 14-9-5 the Dutchmen find itself 20th in the pairwise but two losses and a tie to RPI and along with being swept by Brown and a loss to Princeton loom large right now. They probably need to win all six remaining regular season games to get into the top 16 prior to the conference tournament. Union has won five straight games against Quinnipiac with the Bobcats not winning since the 2015-2016 season ago the Dutchmen. The last Quinnipiac win in Schenectady was back in the 2014-2015 season when they won 4-3. The Dutchmen are a top 20 offensive team in the country averaging 3.04 goals per game. Its a balanced roster that brings the scoring as the top seven players have scored six or more goals and have 16 or more points this season. They are led by three senior forwards in Cole Maier, Brett Supinski and Ryan Walker who have 23, 20 and 20 points respectively this season. Walker leads the team with 10 goals. As we have seen this season this is a team that can score in bunches with the their 5-1 win in Hamden as proof. The Union power play has been solid this season at 18.8% (19-of-101) which is good for 25th in the country. On defense Union has been a little above average this season giving up 2.64 goals per game which is good for 25th in the country. Sophomore Brandon Estes has had a breakout season with 15 points and a plus 7 on the blue line while junior Vas Kolias and senior Greg Campbell have been steady presences for the Dutchmen. If there is an area where Union struggles it is on the penalty kill as they have one of the worst in the country at 74.4% (67-of-90) which is 56th in the nation. This is an area where Quinnipiac's top five power play unit needs to capitalize but we must see how they adjust especially with the season ending injury to Brandon Fortunato. Sophomore Darion Hanson has taken over the starting duties in the second half of the season from senior Jake Kupsky due to the more consistent play from the second year goaltender. Hanson was spectacular against Quinnipiac earlier this season when he made 34 saves in a 5-1 win over the Bobcats in Hamden. His numbers this season are solid with a 2.37 goals against average and a .922 save percentage which are superior to Kupsky's and the reason he is seeing more time in net for the Dutchmen. Expect Hanson to get the nod Friday night. While RPI has a poor record of 8-17-3, they have been pretty solid since the calendar changed to 2019. Since the start of the new year, RPI is a respectable 4-4-3. They tied Cornell, Dartmouth and Union in that stretch and also played to competitive losses against Harvard, Yale and even Brown. Give this team a lot of credit for battling and playing hard in the second half of the season as Dave Smith continues to mold this team into his own. This should be a competitive game against a team that is clearly starting to get better as the season winds down. Scoring continues to be an issue for RPI as they only average 1.93 goals per game this season. Junior Jacob Hayhurst has 23 points but only 3 goals this season while Ottoville Leppanen has 16 points on 3 goals and 13 assists. Juniors Todd Burgess (13 points) and Patrick Polino (11 points) along with defenseman Will Reilly (15 points) make up the majority of the Engineers offense. With RPI not being a high scoring team they have to rely on their defense and goal-tending to keep games low scoring in order to get a bounce here or there on offense to win some of these games. The RPI power play has struggled this season to a tune of just 14.5% (12-of-83) which is 53rd in the country. Defensively RPI has played much better in 2019 than 2018 so far. They are a middle of the pack team in goals allowed at 3.07 which is good for a tie at 36th with Boston University. While Will Reilly has been a consistent point guy for RPI his plus/minus has vastly improved this season as he is an even right now after being a minus 36 combined the past two seasons. Three freshman in Kyle Hallbauer, Jake Johnson and Brady Ferner have given the Engineers a lot of games on the blue line for young players. The experience these players are getting now will only help in the long run and its seemingly paying off with better defensive play in the second half of the season. RPI's penalty kill is middle of the pack at 80.2% (77-of-96) which is good for 34th in the country. Freshman goaltender Owen Savory has taken over the reins in between the pipes from an ineffective Linden Marshall and has run away with the job. Savory has started the last eight games for RPI and has kept the Engineers in pretty much every game against the one against Clarkson. In 17 games played he has a 2.30 goals against average and a .933 save percentage which are excellent numbers despite having a record of 3-9-3. His team has been on the short end of the stick but has been very competitive. He has given this team stability in between the pipes which gives them a chance to compete every single game even with the lack of talent on the roster. Expect Savory to be in goal when they face Quinnipiac on Saturday night. 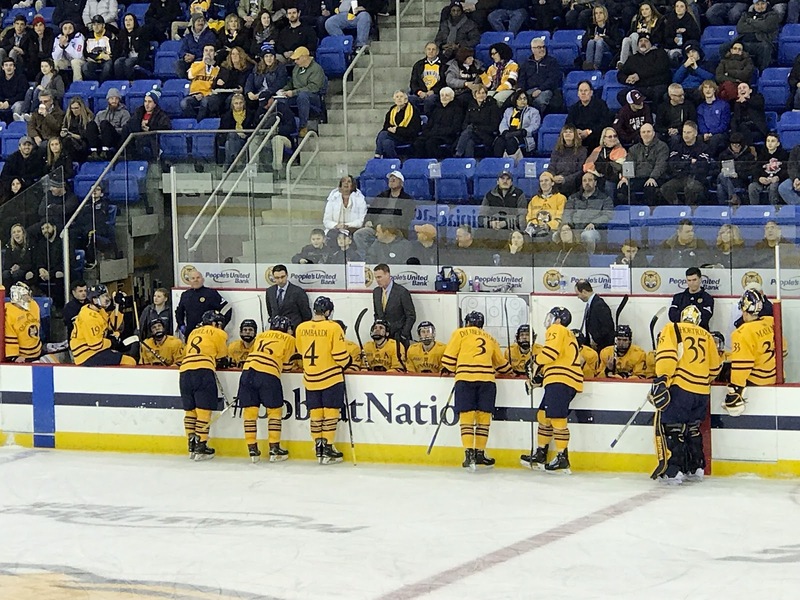 A night after beating up on its Whitney Avenue rival, Quinnipiac had a letdown performance as they were beaten 4-1 by the Brown Bears who swept their weekend slate of games against Quinnipiac and Princeton. 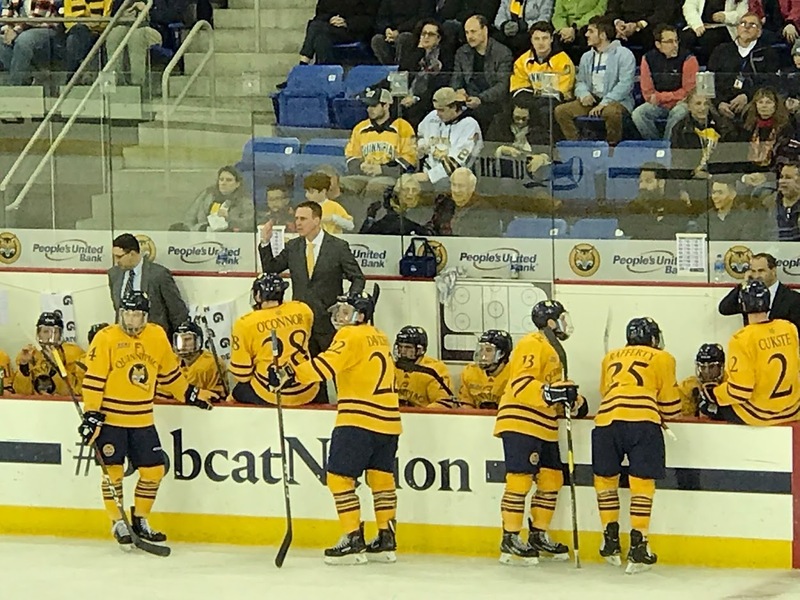 It was a surprise letdown after the strong effort a night ago against Yale when the Bobcats were relentless on the ice and took it to their opponent. Here are my thoughts and observations after the Brown game. - A night after Quinnipiac's best effort of the season when they played a complete 60 minute game, the Bobcats struggled against Brown in their first loss in almost a month. It was very surprising that the energy level was not the same as it was the night before against when they played a rival. The team started slow in the first period and from the get go you could tell it was not going to be as easy as the Yale game was. Quinnipiac is going to need to have better back to back efforts especially when playoff time comes around. I would think Rand Pecknold and the coaching staff will have a tough week of practice after this one tonight. - Quinnipiac had 48 shots on goal but a strong effort from backup goaltender Luke Kania was the difference. Kania saw the puck well and made some key saves especially in the third period. This was Kania's best effort of the season against one of the best teams in the country. Sometimes you need to tip your cap to the opposing goaltender and tonight was one of those nights. - Brown was really strong on the fore-check tonight and it really was a difference for them in their win over Quinnipiac. The forecheck led to a turnover in the Quinnipiac defensive zone which led to the third goal for the Bears. Brown was relentless against Quinnipiac tonight forcing turnovers and making it tough for Quinnipiac to bring the puck into the offensive zone at times. They also had good puck possession on the night that led to their scoring opportunities. Credit to the Bears for controlling the pace of this game and taking Quinnipiac off their game tonight. - One of the themes in three of Quinnipiac's worst losses this season against Dartmouth, Union and now Brown, has been their lack of starting fast in each of them. All three games saw Quinnipiac fail to score in the first period, and in two of those games (Dartmouth and Brown) they failed to score in the first two periods. For Quinnipiac to be successful in my opinion they need those first period goals to put pressure on the opposing team instead of having to chase those teams for goals later in the game. - The Brown defense is highly improved from a season ago even though they lack star power on the back end. They did a great job against Quinnipiac with 19 blocked shots and making sure they limited second chance opportunities and clearing pucks out of the zone effectively. They have a strong work ethic and it seems Brendan Whittet is getting the most out of this team who are now .500 on the season after five consecutive losing seasons. - The first three minutes of the third period saw four goals. Brown took control of the game with two goals in the first minute and five seconds of the period before Brogan Rafferty scored on the power play a minute later. Just when it looked like Quinnipiac might get back into the game, Brown scored a minute later to push the lead back to three goals. The goal by Jack Gessert seemed to take the air out of the building even with a little under 16 minutes to play in the game. - Chase Priskie and Wyatt Bongiovanni combined for 20 shots on net against Brown which was almost half of the teams shots on the night. While Priskie assisted on the Rafferty power play goal both him and Bongiovanni were a combined minus two on the night. Its tough to see two of the teams best players not find the back of the net when they put that many shots on goal. - You have to wonder how much air was taken out from the team after news of the season ending injury to senior Brandon Fortunato which was first reported by the blog Saturday morning. A broken fibula ends the collegiate career to a player that was playing some of his best hockey of the season and of his career. Fortunato who finished the season with 28 points would have likely hit the 40 point plateau had he not gotten hurt. His ability to move pucks out of the zone and his power play ability will clearly be missed along with his veteran presence on the back end. He is only one of five players on the Quinnipiac roster with NCAA tournament experience having been to the Frozen Four with Boston University back in the 2015 season. - How smart does the Quinnipiac coaching staff look now for bringing in Cam Boudreau for the second half of the season? The freshman is going to be thrust into a larger role along with fellow freshman Zach Metsa and Peter Diliberatore with the latter already seeing top four minutes. All three will be relied upon to pick up the slack for their injured teammate along with versatile senior Luke Shiplo. - Andrew Shortridge gave up four goals on 29 shots but I think the defense in front him didn't do a good enough job of clearing pucks out of the zone in this game. This was the first game all season in which Shortridge allowed more than three goals in a game which shows just how good he has been. - With the loss, Quinnipiac now is three points behind Cornell for first place in the ECAC standings. Currently in second place with 21 points, the Bobcats are going to need some help if they want to win the Cleary Cup as regular season champions but that probably requires no more slip ups the rest of the way as well. It probably will be tough to catch the Big Red who have only lost one game since December 1st. - It's on to the capital region of New York for Quinnipiac as they head to Union on Friday followed by RPI on Saturday night. Quinnipiac is winless in six games against Union dating back to the 2015-2016 season when they beat the Dutchmen 5-0 in Hamden. The Bobcats haven't won at Union since November of 2014 when they won 4-3 over the then defending national champions. Quinnipiac took apart its Whitney Avenue rival in dominant fashion winning 4-0. The Bobcats took control of this game early with a goal in the first period but completely dominating puck possession and shots on goal. They finished the game outshooting Yale 50-23 en route to keeping the Heroes Hat in Hamden for another season which is the 7th in a row. Quinnipiac goes for the weekend sweep tomorrow when they host Brown. Here are my thoughts and observations after the Yale game. - What an incredible effort from Quinnipiac. They dominated this game from start to finish. They controlled puck possession, played with a strong pace and peppered Corbin Kaczperski with shots all night. The team never let up and easily could have scored more than four goals on the night. Quinnipiac continues to show they are for real and are showing the ability to play deep into March and possibly April. - While Quinnipiac was excellent in this game, I thought Yale was awful. They played with no pace and got totally outplayed all night long. They were lucky Kaczperski played well or this game could have been worse. I was not impressed by the Bulldogs and they look vastly overrated. As was in the playoffs last year if you shut down Joe Snively, the rest of the team folds. - The dominance by Quinnipiac over Yale is just astounding at this point. They are 15-2-4 against the Bulldogs since 2011. However I'd reverse that record in a heartbeat if Quinnipiac could have that loss in Pittsburgh back in 2013 to a National Championship win. - Quinnipiac was without senior defenseman Brandon Fortunato who got hurt in practice. A source told me he lost an edge on his skates and went into the boards. The time frame of the injury is unknown at this time but his loss is huge as he has been one of Quinnipiac's best players this season on the back end and is a weapon on the power play. Some players are going to have to step up with Fortunato out notably Luke Shiplo, Zach Metsa and Cam Boudreau. Tonight Shiplo stepped up with a goal. - Of the 12 points on the night for Quinnipiac, 5 of them came from freshman with William Fallstrom and Michael Lombardi scoring their 6th and 5th goals respectively. Fellow freshman Desi Burgart, Peter Diliberatore and Ethan de Jong added assists. This has been a very special freshman class and one that should continue to keep Quinnipiac in the mix the few years. - Nick Jermain played his best game of the season with a goal and an assist effort. His goal in the first got Quinnipiac on the board while he assisted on Michael Lombardi's goal in the third period. Getting Nick Jermain hot could be a big boost to the Bobcats offense down the stretch as he is a player with good offensive skills. - TJ Friedmann was back in his familiar number 19 on Friday after wearing Joe O'Connor and Matt Cassidy's uniforms the past two games. - Andrew Shortridge picked up his fourth shutout of the season in the victory while lowering his goals against and save percentage to 1.14 and .955 respectively. He clearly has been the best goaltender in the ECAC this season and possibly the country. He made 23 saves tonight and played flawlessly. He never gave Yale a chance and limited the amount of rebounds. - Quinnipiac is in second place in the ECAC standings all by themselves after the win over Yale but could have ended the night in first place had Clarkson beat Cornell. Instead the Golden Knights laid an egg and got blown out at Lynah Rink 5-0 against the Big Red. While Quinnipiac holds the tiebreaker over Cornell due to a win and a tie they still trail by a point in the standings. - Quinnipiac now faces a Brown team that is inching closer to the .500 mark at 9-10-3. They went to Princeton and beat a struggling Tigers team 4-2 at Hobey Baker Rink. 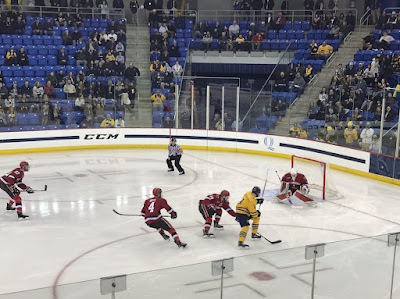 With the Yale game in the rearview mirror, Quinnipiac needs to make sure it sweeps this weekend slate of games and keep pace with Cornell at the top of the ECAC standings. A week after an impressive sweep in North Country, Quinnipiac returns home with its Whitney Avenue rival waiting in the wings. While Quinnipiac treats this as a rivalry game I am not sure the same can be said on the Yale side. Frankly I think the Bobcats rivalry with Cornell is more real because the hatred is real between the two teams and they have faced off in multiple playoff series. After a 7-2-2 start, the Bulldogs have cooled off going just 4-5-1 since December 11th. This under .500 stretch has pushed them to 22nd in the pairwise rankings and needing a strong finish to jump up into the top 16. Yale is 28th in the country in goals scored at 2.95 per game but take Joe Snively out of the equation and this is a totally different Yale team. Snively who has 27 points on 13 goals and 14 assists accounts for 20% of the Yale goals this season. He is the key in order to shutting down the Bulldog offense. If you can prevent him from getting on the score sheet there is a good you are going to win the game as the Bulldogs offense outside of him struggles to generate much offense. A lot was expected of Bruins 4th round pick Curtis Hall but he's amounted just 5 points this year. Three players outside of Snively have 14 points apiece in junior Robbie DeMontis, sophomore Kevin O'Neil and freshman Justin Pearson. Even more was expected out of the Smith twins and they have combined for just 16 points. If there is an area where Yale has been good, it is the power play as they are scoring on 20% of their chances this year which is good for 20th in the country. The key for Quinnipiac must be to shut Snively down. On defense Yale is about in the middle of the pack at 2.71 goals allowed per game which is 27th in the country. They have some nice talent back there in players like Phil Kemp, Jack St. Ivany and Chandler Lindstrand but the expectation was the defense would have been a bit better as Graham Lillibridge has probably played below expectations. On the penalty kill the Bulldogs are average at 81.4% which is good for 28th in the country. Keith Allain continues to split his goaltenders. Sam Tucker and Corbin Kaczperski have basically split the season in net. While Kaczperski was clearly the better goaltender last season when they platooned, this year it is Tucker with the better overall numbers at a 2.30 goals against average and a .920 save percentage while Kaczperski has a 2.70 goals against and a .897 save percentage. With the two teams tied in the ECAC standings, the winner of this game could find itself in first place in the conference at the end of the night depending on other results from around the conference. Quinnipiac has eight straight wins against Brown dating back to the 2015-2016 season and a ten game unbeaten streak against them dating back to the 2014-2015 season. The last Quinnipiac loss against Brown came almost five years ago on February 15, 2014 when they lost a 4-2 game at Meehan Auditorium. The Bobcats have dominated this series including playoff series wins in 2017, 2012, 2011 and 2008 to boot. Brown has an offense that has struggled at times to find the back of the net. Averaging just 2.57 goals per game, that ties them for 42nd in the country in that category. They lack high end talent that can score goals in bunches. Tommy Marchin is the leading scorer at 13 points while freshman Tristan Crozier has given them 11 points on 4 goals and 7 assists. Fellow freshman Justin Jallen has five goals while sophomore Joachim Weberg has five as well. The Bears are the worst team in the country on the power play converting at just a shade of 9% (6-of-66) so they are not a major threat in that category but its always wise not give teams the man advantage. Defensively Brown is a middle of the pack team giving up 2.86 goals per game which is 34th in the country. Zach Giuttari has been really good on the back end for Brown with 11 points, 4 game winning goals and is a plus 10 this season. Senior Max Gottlieb has 9 points and is a plus one. On the penalty kill Brown is 26th in the country at 82.6%. Brown will need a strong effort out of its defense as Quinnipiac possesses a lot of fire power on offense and many ways they can beat you. Gavin Nieto has gotten the majority of the starts for Brown and has stabilized the position going 7-5-1 with a 2.45 goals against average and a .912 save percentage with one shutout. He has won three of his last four starts and has six wins since the start of December. The California native has gotten better in each season for the Bears and he will need to play well for Brown to have a chance against a good Quinnipiac team. Quinnipiac has the better talent and overall the better team. Give Brown credit for playing almost .500 hockey with the lack of elite talent they have on the roster. The Bobcats need to keep hot and beat a lesser team in Brown as they strive to winning the Cleary Cup. After a weekend that saw Quinnipiac take four ECAC points in North Country, two players were honored as ECAC player and rookie of the week respectively as announced in a press release by the league office. For the second time this season Odeen Tufto has been named the ECAC player of the week after a two goal, four assist performance in helping Quinnipiac to a pair of wins this weekend. Both of Tufto's goals came by way of the power play. At 35 points on 13 goals and 22 assists he is closing in on back to back 40 point seasons in his first two collegiate campaigns. Quinnipiac freshman Wyatt Bongiovanni was also honored for the second time this season as the rookie of the week. His two goal, one assist game against St. Lawrence earned him the honors once again as he was previously the rookie of the week for the week of November 19th. Bongiovanni has 16 points this season on 10 goals and 6 assists. His 10 goals this season put him third on the team for goals scored behind Chase Priskie and Odeen Tufto. Congrats to both players on your ECAC weekly award honors. Quinnipiac swept its first North Country road trip since the 2012-2013 season after a 7-2 win over St. Lawrence on Saturday night just one night after downing #10 Clarkson 4-2. We all know that Quinnipiac ended that season with a Frozen Four trip to Pittsburgh before losing to Yale in the National Championship game. This team has goals of reaching Buffalo down the road in April but it must continue to take care of business in the ECAC schedule down the stretch along with securing home ice in the playoffs and a possible Cleary Cup for the regular season champion. Here are my thoughts and observations after the St. Lawrence game. - A night after a quality 4-2 win over Clarkson, Quinnipiac took care of business like they were suppose to do against an awful St. Lawrence team winning 7-2 at Appleton Arena. It was clearly a stat padding game in my opinion but taking home four key ECAC points this weekend was huge. Mark this years North Country trip which is always tough a huge success. - Even though Quinnipiac won convincingly Saturday night they still dropped in the pairwise rankings from the three to four. That is due to the fact that St. Lawrence is the second worst team in the country. Quinnipiac still has two remaining games against bottom feeders in RPI and this St. Lawrence team again which won't help in the pairwise rankings. - St. Lawrence is one of the worst teams I have seen in awhile dating back to those Princeton teams from a few seasons ago. I think St. Lawrence is going to regret the hiring of Mark Morris. While he was a big name hire I am not sure he was the right hire. He was out of the college game for 14 years and a lot has changed in terms of how players are recruited along with the student/athlete needs as well. In three short years he destroyed the program that Greg Carvel built into one that is currently one of the worst programs in the country. St. Lawrence is on pace to set a program high for losses in a season which was just set a year ago. - St. Lawrence is such an undisciplined team as they took nine minor penalties that led to eight power plays for Quinnipiac. The final penalty was at the buzzer. Quinnipiac made the Saints pay with three power play goals including their first two of the game. - Quinnipiac got big nights from some of its best players. Odeen Tufto had four points on a goal and three assists as he continues to close in on back to back 40 point seasons. Chase Priskie continued to add points to his Hobey Baker candidacy as he now has 33 points and leads Quinnipiac goals with 14. Brandon Fortunato had three more assists as he now has points in his last seven games. Ethan de Jong had two goals to hit the 20 point plateau as a freshman while Wyatt Bongiovanni added two goals and an assist as he now has 10 goals this season for the Bobcats. - TJ Friedmann once again had to use another players jersey this time he wore Matt Cassidy's jersey. This is bizarre and not something I have ever seen before. - Andrew Shortridge made his 7th straight start for Quinnipiac and made some nice saves in this game to finish with 14 on the night. With the game in hand in the third period, Quinnipiac head coach Rand Pecknold put Keith Petruzzelli in for his first action since the 5-4 overtime loss to Colgate. It was good to keep Keith fresh and get some time in between the pipes especially with the game well in hand. - Quinnipiac got a nice gift last night after beating St. Lawrence when RPI tied Cornell. The Bobcats picked up a point on the league leading Big Red in their quest for the Cleary Cup. - Eight ECAC games remain on the schedule with four at home and four on the road including a tough road game at Union who has been a thorn in Quinnipiac's side the past few years along with Clarkson again and two with Yale. They also have two with Brown and single games against RPI and St. Lawrence remaining. Just looking at the schedule this team should have at least 25 wins entering the ECAC tournament. - Speaking of Yale, its officially that week again as these two teams will go head to head Friday night in Hamden. The student tickets sold out in 10 seconds as they know these games are always circled on the teams calendar. The Hero's Hat will be presented to the winner of the game on Friday night.